Home » Knowledge Centre » What Are Search Partners On Google AdWords? Have you ever noticed when creating a Google AdWords campaign that Google’s settings give you an option to include search partners? But what actually are search partners on Google AdWords? This article aims to break down what search partners are, where your adverts could appear, and highlight the benefits and challenges of Search Partners. Search Partners are essentially a network of websites that have partnered up with Google to showcase their adverts to increase visibility across Google and its partner websites. It’s a default setting set when you first set up a campaign on Google AdWords and is an extra way of Google expanding your visibility across their own platforms and external websites. You can choose to opt out at any time by unticking the Search Partners box in your campaign settings. Where Do Search Partners Appear? Google’s Search Partner Ads may appear in different search result pages, on-site directory pages or other related content where the user has shown similar purchase intent. For some unknown reason, Google keep their AdWords Search Partner List secretive. 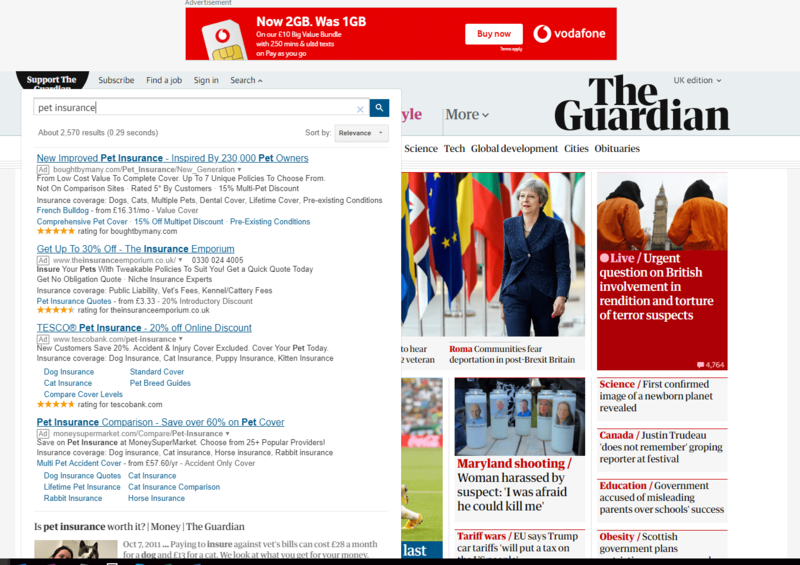 There is a list which some warrior collated together all the way back in 2003, so take it with a pinch of salt but it does give you an idea of some of the different type of sites where you adverts could appear. However, what we do know is that Google Search Partner Ads can be positioned on the search results for Google’s own products such as Google Shopping, Google Play and Google Maps as well as some very reputable websites such as eBay, YouTube, Amazon, The Guardian and many more. Google Search Partners are a fantastic opportunity to extend your reach across different channels and through various mediums hitting relevant audiences. If someone told you that you could get your advert on the likes of Amazon or eBay which gets millions of visits per day for a small CPC (varies by business), you’d bite their hand off! Personally, I’ve seen a great return with very high efficiency levels from Google Search Partners but I’ve also built some other campaigns that haven’t been as successful. You would more likely find that Google Search Partners have higher success rates with a retail business rather than a service-based company. The service-based companies would be great for showing across Google’s products such as Google Maps as that ties in with locality but retail will go further with the likes of product ads on eBay, Amazon and Gumtree. You normally receive a lower CPC when using Google Search Partner ads than the standard Google Search advert. On average, I would estimate that it’s around 50% cheaper through Search Partners based on the numerous AdWords campaigns I have managed. It does differ by company but the majority across the different industries which I have managed has come out with a much reduced CPC. Search partners tend to cause lower CTRs (Click-Through-Rates) so you will need to test to see if reward outweighs risk. If you find the CTR is too low across the campaigns, you can always untick the Search Partners box and see if this improves your campaigns and quality score. You also can’t really optimise Google Search Partner Ads, the closest you can get is segmenting search queries by search partners and looking at the search query in Google AdWords. The search term normally matches up with a URL string from one of the websites your ad has appeared on which you can then choose to negative out if the query is irrelevant to your advert. It is also frustrating that Google doesn’t give you the same sort of access to Search Partners like Bing does. There is little to no control in Google, you can’t block websites, see where you’re appearing or build a Search Partners only campaign – you can do all of this activity within Bing Ads. For once, Bing are more advanced in a feature than Google! It is dependent by business whether Google Search Partners will work for you. For that reason, I would suggest that you trial Google Search Partners for a few months and see if it is a right fit for your business. Segment the data and see if it is profitable for your business. Undertake some A/B testing with other camp aigns so you generally get an idea of the difference between a campaign with search partners vs a campaign without. If you have a tight budget, I’d recommend sticking with Google Search only as Google Search Partners doesn’t normally outperform a standard AdWords Search campaign, so use the limited money you have to higher converting campaigns without search partners. 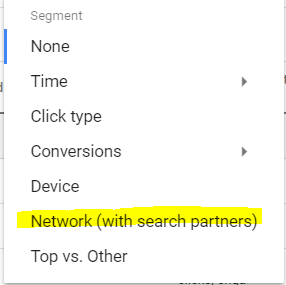 If you already have campaigns running but can’t remember if you have set up search partners upon campaign creation then you can segment search partners in your ‘Campaigns’ tab and then segment by ‘Network (with search partners)’. Results will show from your Search Partners network vs the Google Search network where you can then formulate a decision whether to carry on with Google Search Partners or if it’s time to let go. It’s all about trial and error!